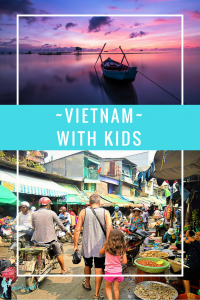 This guest post from Melissa at the Thrifty Family Travels has inspired us to think of Vietnam for family travel. Check out her bio below. 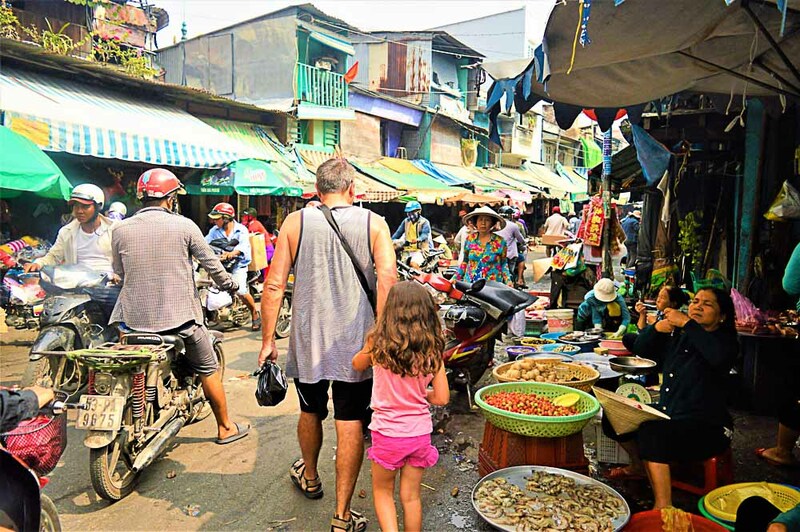 Vietnam is a great destination to take the kids for a Southeast Asian adventure. From its chaotic cities, stunning countryside and paradise-like beaches, it is the perfect mix of culture, history and relaxation. 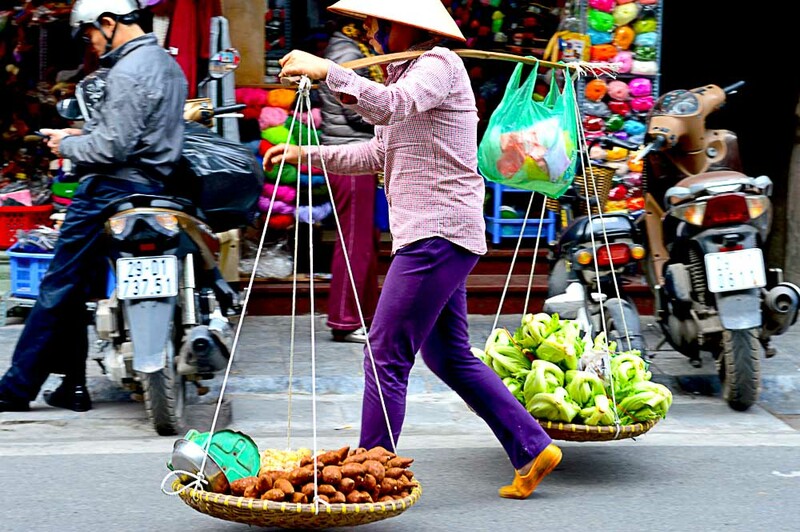 Not to mention the delicious Vietnamese food and that it is a relatively cheap country to visit. 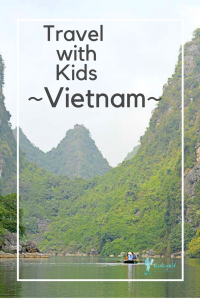 Due to Vietnam’s long and skinny shape, it also a really easy country to travel around with kids. Usually you will fly into either Hanoi in the North or Ho Chi Minh City in the South and travel in one direction either down or up. You can easily get between all the major cities by bus, train or plane. We recently travelled for three weeks throughout Vietnam with our five-year-old. Following is a quick overview of our itinerary, what our highlights were in each destination and where we stayed. We started our journey in the North of Vietnam in one of the country’s busiest and colourful cities, Hanoi. We spent four nights in Hanoi and stayed at the Real Hanoi Hotel, which is located in a very central part of the Old Quarter. Halong Bay is one of the most scenic regions in Vietnam and is a must do for anyone visiting the country. The bay is filled with thousands of giant limestone cliffs which jut from the water and are covered with lush rainforests. Halong Bay is best visited by a one- or two-night cruise. There is a stack of different tours to book, but we went with a one-night cruise with Royal Palace Cruise and loved it. Most cruises follow a similar itinerary and include activities such as swimming, kayaking, squid fishing, tai chi, hiking, and cave exploring. 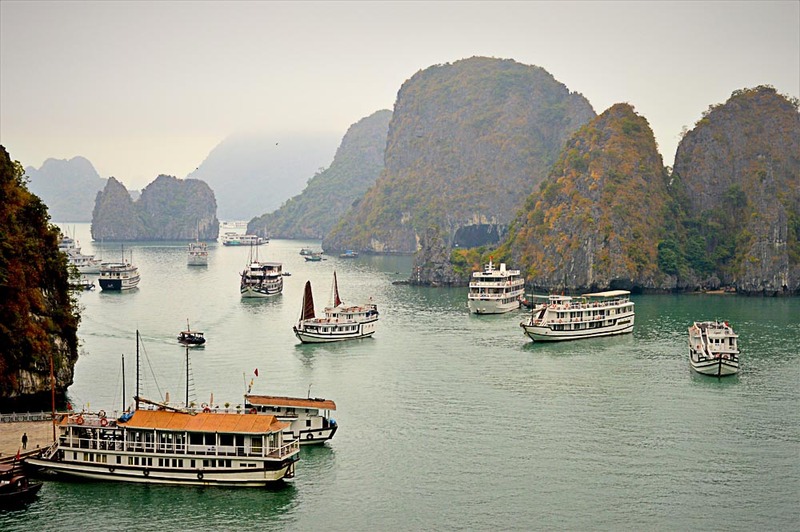 Most cruises will arrange to pick you up from your hotel in Hanoi and drive you four hours to Halong Bay. A few hours south of Hanoi is the gorgeous countryside town Ninh Binh. Ninh Binh is an easy day trip from Hanoi, but if you have more time I highly recommend a day or two to explore the area. 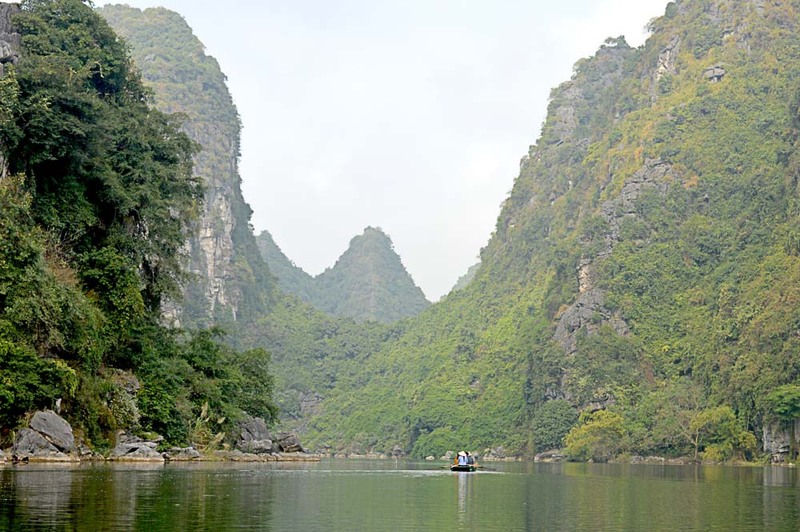 Ninh Binh is well known of its gorgeous waterways around Tam Coc and Trang An, where spectacular limestone cliffs jut out of the emerald green water, hence the name inland Halong Bay. We spent one night in Ninh Binh and stayed at La Belle Vie Tam Coc Homestay which is a short walk from the ticket booth for Tam Coc. To reach Ninh Binh we arranged a private driver from Halong Bay. To reach Hoi An we flew from Hanoi to Danang and then took a 40 minute taxi ride to Hoi An. We spent four nights in Hoi An and stayed at the An Hoi Hotel which is in a fabulous location only a few minutes’ walk to the old town and also has a swimming pool. Located in the far south of Vietnam is the country’s capital Ho Chi Minh City. To reach Ho Chi Minh City we flew from Danang to Ho Chi Minh City. We spent two nights in Ho Chi Minh City and stayed at the Graceful Saigon Boutique Hotel located in District 1, which is also known as the Backpackers District. Despite its name, this area is perfect for families with loads of cafés and shops. 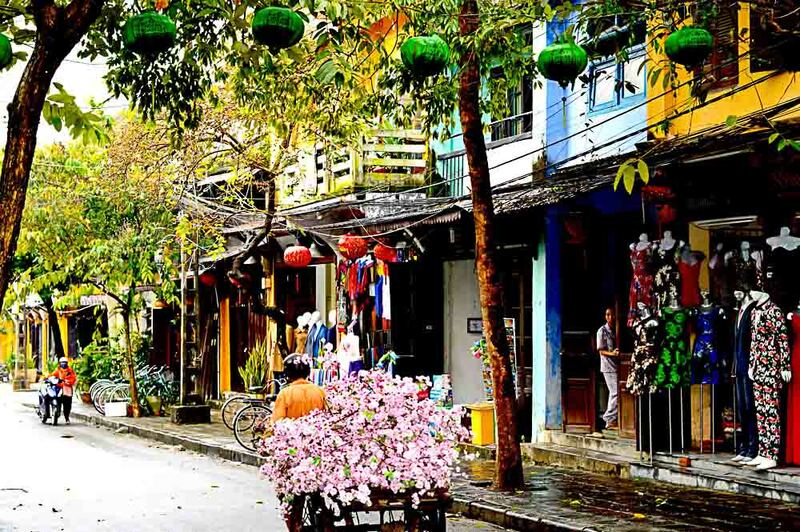 Located four hours drive from Ho Chi Minh City is Can Tho, a city located in the Mekong Delta. Whilst Can Tho is just another large modern Vietnamese city, it’s the local villages outside the city that are the real attractions. We arrived in Can Tho by arranging a private driver. We spent two nights here and stayed at the Nguyen Shack. I can’t recommend the Nguyen Shack enough for families – it is fantastic! 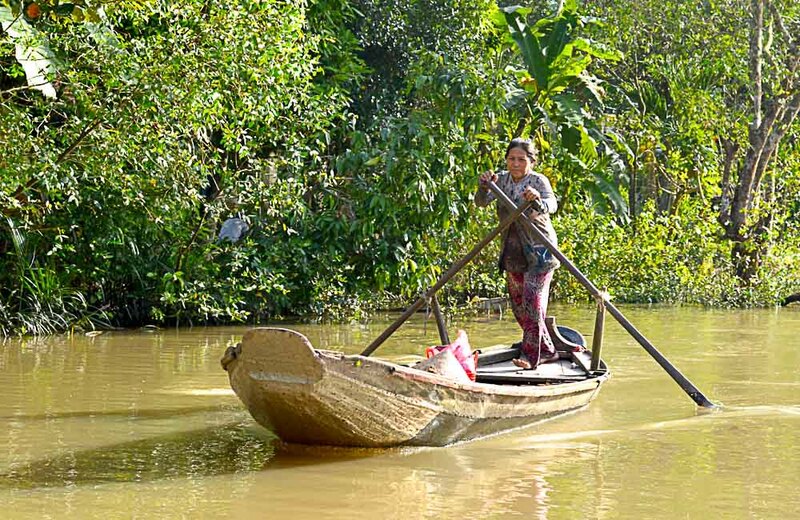 The guys at the Nguyen Shack will take you on various tours around the Mekong Delta. 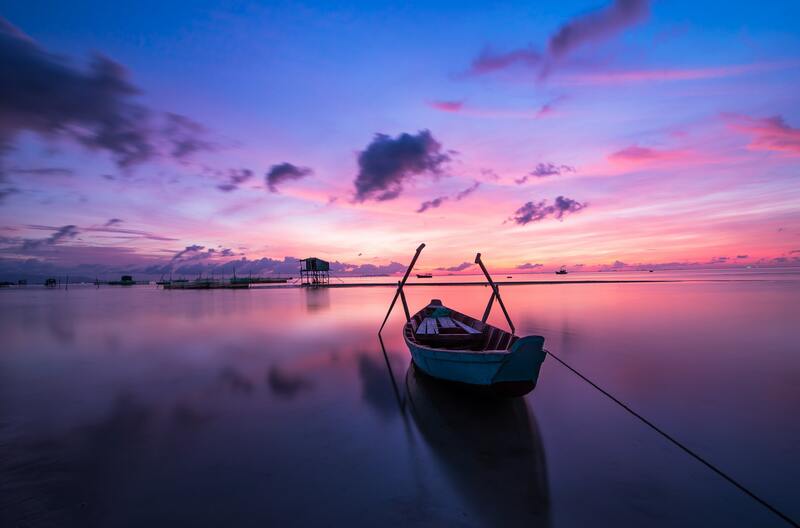 Phu Quoc is Vietnam’s island paradise located a short flight from Ho Chi Minh City or Can Tho. 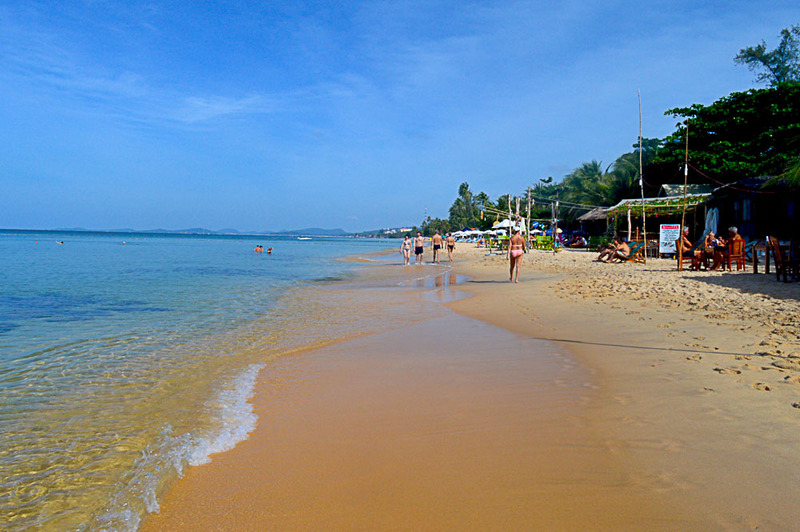 We spent five fantastic nights on Phu Quoc staying at Viet Thanh, in a basic bungalow right on the beach. Make sure you check this South East Asia packing list before you go. Melissa is the creator and writer for the Thrifty Family Travels website, which details her family’s travels both locally and across the globe. Together they travel the world, experience new cultures, indulge in local delicacies, and explore every corner of our beautiful earth, navigating their way around the world. Thrifty Family Travels hopes to inspire other families to travel and to show them all the fantastic places the world has to explore. Say hi on Facebook, Instagram, and Pinterest. TravelingMel.com is a participant in the Amazon Services LLC Associates Program, an affiliate advertising program designed to provide a means for sites to earn advertising fees by advertising and linking to amazon.com, amazon.co.uk, amazon.ca. Amazon and the Amazon logo are trademarks of Amazon.com, Inc. or its affiliates. Read our full Disclosure Policy for more.